Why is KidWorks still celebrating Christmas in January? Because we are so awed by the generosity of the many generous supporters who brought the joy of the season to hundreds of parents and children we serve. We hosted several events during the holiday season that brought tremendous joy to the students and families we serve. Most of the families KidWorks serves struggle financially—yet like everyone else they strive to make the holidays a very special time of year. Our generous supporters stood beside those families once again this year to make sure Thanksgiving had “all the trimmings” of joy, fellowship and relationships. More than 1,000 turkeys were distributed to families in central Santa Ana—more than twice the number provided in 2016. It was all part of KidWorks’ Operation Gobble event. KidWorks especially thanks Assemblymember Tom Daly of District 69 (representing Santa Ana, Anaheim, Garden Grove and Orange), who donated the turkeys and arranged for the distribution event. We also thank the many volunteers from Astronics, Laborers International Union #652, UPS and Astronics Test Systems for greeting the families and handing out turkeys. Other event supporters include the International Brotherhood of Electrical Workers, Orange County Employees Association, Santa Ana Police Officers Association, State Farm and Teamsters Local 952. Mater Dei High School in Santa Ana has been a tremendous partner with KidWorks for so many years—and they made sure to be there to wish our students a joyous Christmas 2017. In early December, the school hosted a Winter Fest event enjoyed by 100 of our kindergarten through fifth graders. 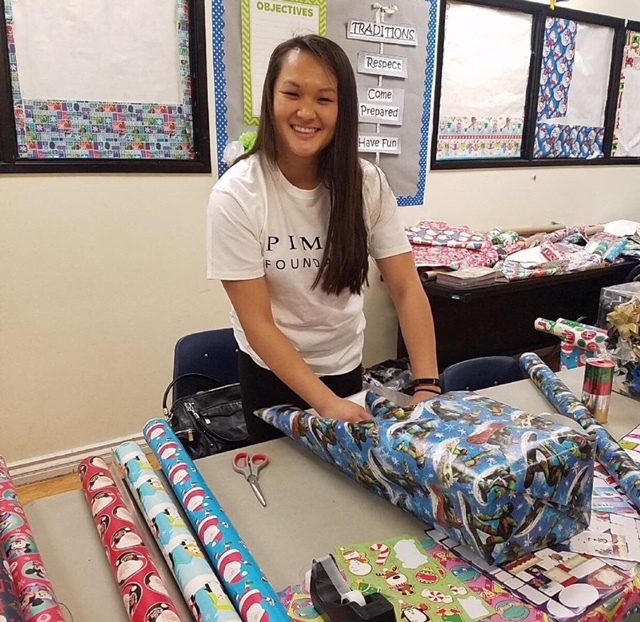 Soccer Coach Matthew West and 67 of his girl soccer team members treated our students to arts and crafts, a photo booth and a friendly game of soccer—all with Christmas music playing to set the holiday mood. Mater Dei also generously arranged for Italian ice deserts and holiday gift bags for all the children. A number of our students have been blessed to attend Mater Dei over the years, and we appreciate their generosity and love for our students in so many countless ways—not only during the holidays but all year round. Those gifts ranged from dolls, LEGOs, skateboards, bikes, gift cards, stuffed animals, headphones, speakers, makeup, purses, backpacks, coloring sets, book sets and more. That meant that 200 sets of parents were able to shop at our Christmas store, and nearly 700 children received gifts. On top of that our Youth Engagement Network distributed gifts in the neighborhood surrounding KidWorks’ centers, and additional gifts were presented to children enrolled in our licensed preschool. A total of 54 volunteers helped sort gifts, set up the store, wrap presents and assist parents carrying packages to their vehicles. The volunteer teams from DPR Construction and PIMCO helped make everything run so smoothly. A special KidWorks “thank you!” goes out to Mariners Church. They donated 1,000 gifts. We are also grateful for the generous donations from Hispanic 100, St. Andrew's Church and the Marconi Automotive Museum. “The real gift of Christmas has always been to be able to give rather than to receive,” Melissa says. 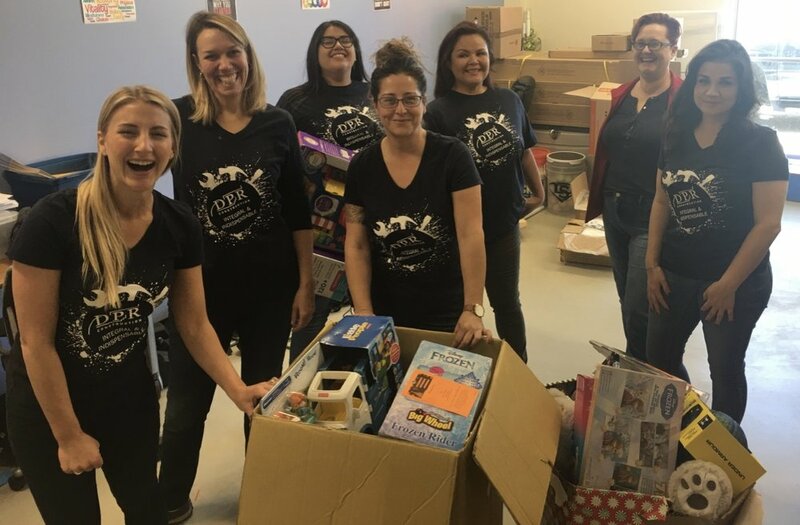 “Not only did all of our Christmas store supporters give, they also provided the means for parents to give as well, no matter what their economic circumstances might be. For that we are so very grateful!